It's the most wonderful time of the year. No, not Christmas. For every Magic player it's Spoiler Season, the chance to see what the newest cards will be. It's an exciting and wild ride for the few weeks leading into the drop of the newest set. Vona's Hunger falls into a long line of "Edict" effects. Forcing someone to sacrifice creatures is not only handy to get around Hexproof or Shroud, but also has the flavour of you killing one of your loved ones at the request of this malicious vampire conquistador makes it feel like a huge blowout. It being an Instant makes attacks suddenly go away if they have to lose an aggressive creature. 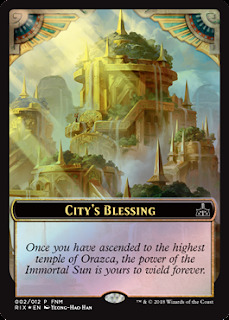 When you have the "City's Blessing" it's an even meaner edict, as the Golden City itself condones the death of half your army. Ascend is the new mechanic here. Now we know what the promo City's Blessing token is for: once you have ten or more permanents, you're blessed by the Golden City, and your cards with Ascend scale up. As a mostly Standard player, I have to consider what each set's offerings do for that format. Though I don't see decks trying to power out ten permanents as fast as possible, I can see certain cards with Ascend making it in Standard play. It favours Midrange, a deck that makes land drops and on curve creature plays. There's me in Control with my 9 lands and Search For Azcanta before I can reach Orazca, and anyone on Ramunap Red should be concerned if they go above six lands in play. 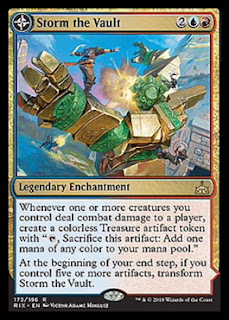 As for Vona's Hunger itself, it'll be very good in Commander as the smaller and bigger modes both say "each opponent". Mazirek should be buzzed. As of the posting of this article, there hasn't been anything added to the many sites I plunder for new cards. 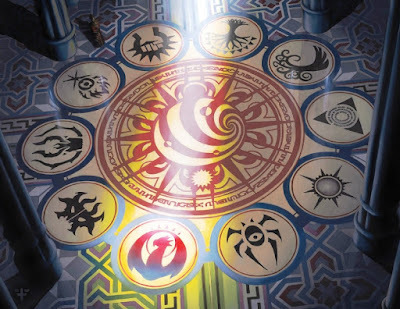 However there's a few early spoilers that I want to talk about, before going into Rivals. The beautiful border is back, and what an effect. 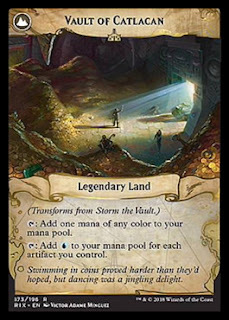 A strictly better Tolarian Academy to match Itlimoc - the strictly better Gaea's Cradle. It blows the mind to see Wizards so bold to sneakily reprint banned, reserved list cards. However, turning off fanboy mode, I have to wonder about it's utility in actual play. 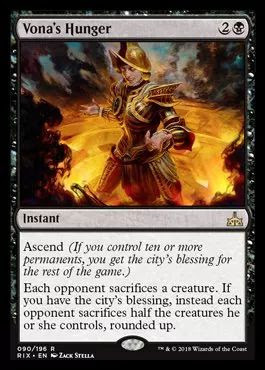 Though Modern Affinity can sneeze into flipping this, it neither has the mana nor the need to cast a four-drop early enough for it to be relevant - it also doesn't need that amount of ramp. 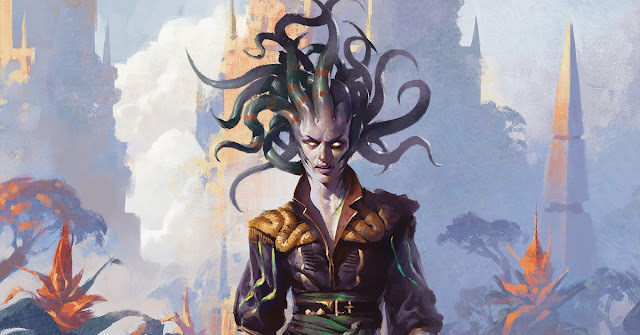 In Standard, while the front half does lend itself to an aggressive Pirates tempo shell, with evasive and fast creatures, the Vault would only be fixing and unnecessary ramp based on the amount of Treasures and Fell Flagships you have. If it had a home in Standard, I'd say it's possibly good somewhere in the old Grixis Improvise/Colossus decks. Swing in early with your Glint-Nest Cranes or Maverick Thopterists to flip the Enchantment into a Land and hard-cast Metalwork Colossus whenever you fancy. I do miss Grixis Improvise and if anything could bring it back, this could. At the very least I want a copy of this card just for Breya, Etherium Shaper. It's sad to admit that of the four tribes of Ixalan, the fish got the short end of it. 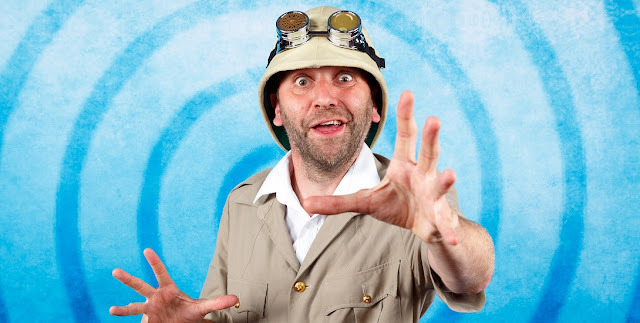 Dinosaurs and Pirates struck a chord with the player base, adding Standard all stars like Rampaging Ferocidon and Hostage Taker to the fray - while having amazing three-colour legendary creatures like Gishath and Admiral Brass to lead them into the EDH tables. Even Vampires are seeing play in a Mono-White Deck with the fair card known as Oketra's Monument. 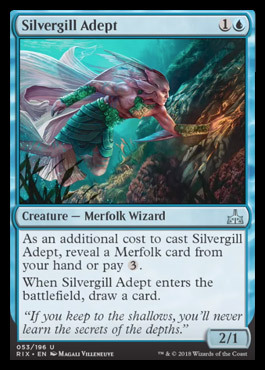 Sad to say, but the Merfolk have been left out to dry in Ixalan Standard, but no more. Tribal all star Silvergil Adept is back. Not seen since Lorwyn, where it was a welcome two-drop in the Merfolk decks in the original Tribal format, it is deeply welcome here, being aggressively numbered and replacing itself in hand despite its low low mana cost. 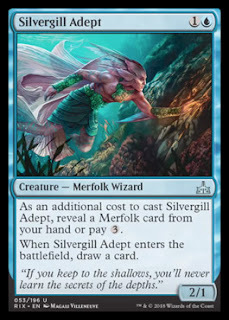 This coupled with stirrings of a new Merfolk Lord can put Merfolk into contention that the Tribe that's been tier two in Modern and Legacy for years could be the Standard powerhouse it deserves to be. With all that excitement, I hope you remember that this is only the very beginning of Rivals of Ixalan Spoilers. 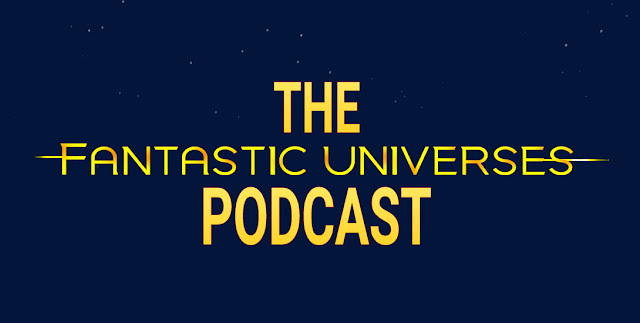 Find them here on Fantastic Universes with commentary on each card as they arrive from The Mothership.